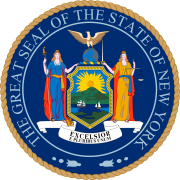 The 1974 United States Senate election in New York was held on November 5, 1974. Incumbent Republican U.S. Senator Jacob K. Javits won against Democratic challenger Ramsey Clark in a three way election. The convention used a weighted voting system. Cohn was eligible to seek a primary, but opted not to. This page was last edited on 22 March 2019, at 03:30 (UTC).